Distance: 11km with a detour to the Deer Pool. Where: Tail head is from Mattamolla car park near the waterfall. The bushwalk from Wattamolla to Big Marley in the Royal National Park has plenty to offer. At Wattalmolla you have a lagoon, waterfall, dam, lookouts and a beach. It has it all. The trail head is at the car park nearest to the waterfall. Cross the stream at the top of the Wattamolla waterfall and your on your way. 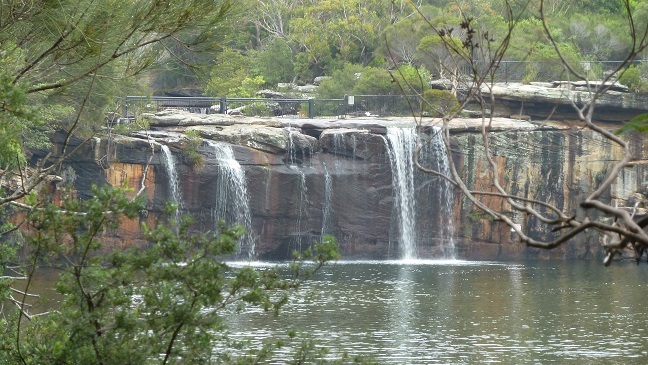 The first attraction is Wattamolla Dam. It’s at it’s best after a bit of rain and is less then a kilometer into the walk. Start walking towards the coastline. The ocean views are sensational as you walk along the cliffs. The first beach you’ll make your way to is Little Marley. Keep going on the Coastal Track and you’ll hit is Big Marley beach. At Big Marley there are dunes and another lagoon. Marley heads is also worth a look. The sandstone weathering up there is awesome. To avoid going back the same way take the inland loop. The start of the track is just south of Big Marley. You would have passed it on your way to the beach. If you have a bit of gas in the tank you can check out the deer pools. Taking the loop and heading back to Wattamolla adds an extra 2 km’s and makes the bushwalk about 11 km’s. So a nice decent strut with plenty to see. Below is a youtube clip of Wattamolla. Goto the youtube tab below to see a clip of the actual buskwalk. Wattamolla to Big Marley Trail Map. Photo Gallery of Big and Little Marley. The link below is the hike to Marley Beach from Wattamolla. This is one section of the famous Royal National Park Coastal Walk. Google Map Link. The Wattamolla to Big Marley trail head is located at the Wattamolla car park nearest to the waterfall. Cross the stream at the top of the Wattamolla waterfall and your on your way.